Misfit Toy Scene from Rudolph the Red Nose Reindeer! 9 1/2' Wide x 7' Tall! This Gemmy Air Blown Inflatable Christmas Decoration comes with built in fan. Internal lights to create a glowing night-time display, yard stakes, stand and tethers. Great Birthday Present, Christmas Gift or Stage Prop! Inflates in minutes with a built-in fan. UL Listed for Outdoor-Indoor use. THANKS FOR LOOKING AND HAPPY SHOPPING. 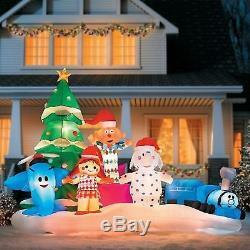 The item "Christmas Inflatable Misfit Toy Scene from Rudolph the Red Nose Reindeer! 7ft" is in sale since Thursday, November 8, 2018. This item is in the category "Home & Garden\Holiday & Seasonal Décor\Christmas & Winter\Yard Décor". The seller is "giftsaroundtheworld-2008" and is located in Canton, Ohio. This item can be shipped to United States.